TNT Post and Donald Duck Magazine issued a unique Donald Duck Stamp to celebrate the 3000th issues of the magazine on April 02, 2010. It was 3000 weeks ago exactly on April 02 when the first issue of Disney’s Donald Duck magazine went off the press in the Netherlands. Since then, there have been 975 million copies of the magazine in the circulation. 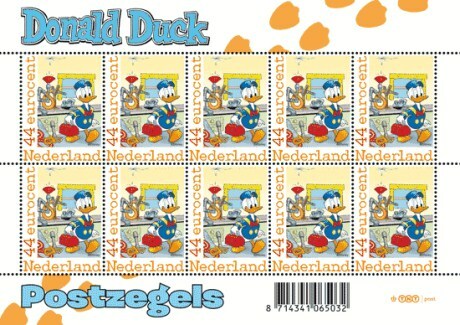 Along with the circulation of 225,000 copies of “Donald Duck” postage stamp, a special anniversary issue of Donald Duck magazine was also part of the celebration.